The RØODE VideoMic is a professional grade 1/2" condenser shotgun microphone designed for use with consumer video cameras and personal audio recorders. The integrated Rycote Lyre based shock mounting system isolates the VideoMic capsule and electronics from its all-metal shoe mount, providing isolation from external physical factors that may cause unwanted rumble and vibrations in the microphone. Constructed from a single piece of hard-wearing thermoplastic, the Lyre provides superior acoustic suspension to traditional elastic solutions, and will never wear out, sag or snap. 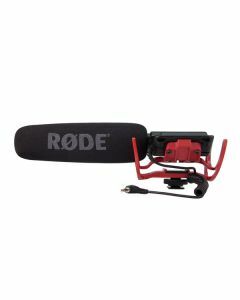 The RODE VideoMic directional on-camera microphone is designed in Australia and covered by RODE Microphones' industry leading 10 year warranty.